Starting today and running through Sunday, June 17, 2012, US American Express Membership Rewards members will receive a 30% transfer bonus when transferring American Express Membership Rewards points to Jetblue TrueBlue points. While this is not as lucrative as the 50% Bonus On Amex To British Airways, this can still be a good deal if you are planning to book an award or need a few extra miles to top off your account. 30% Amex to JetBlue transfer bonus. The usual ratio is 250 Membership Reward points : 200 TrueBlue points but with this bonus it is 250 Membership Reward points to 260 TrueBlue points. The bonus is hard coded into the transfer ratio. JetBlue has hub cities in New York-JFK, Boston, Ft. Lauderdale, San Juan, PR, and Long Beach. They also have a lot of Caribbean service especially from San Juan, so this could be another option. TrueBlue points can only be redeemed for about 1.04-1.5 cents each in value for any available seat on the plane, just as though you were paying regular airfare, only using points instead of cash. 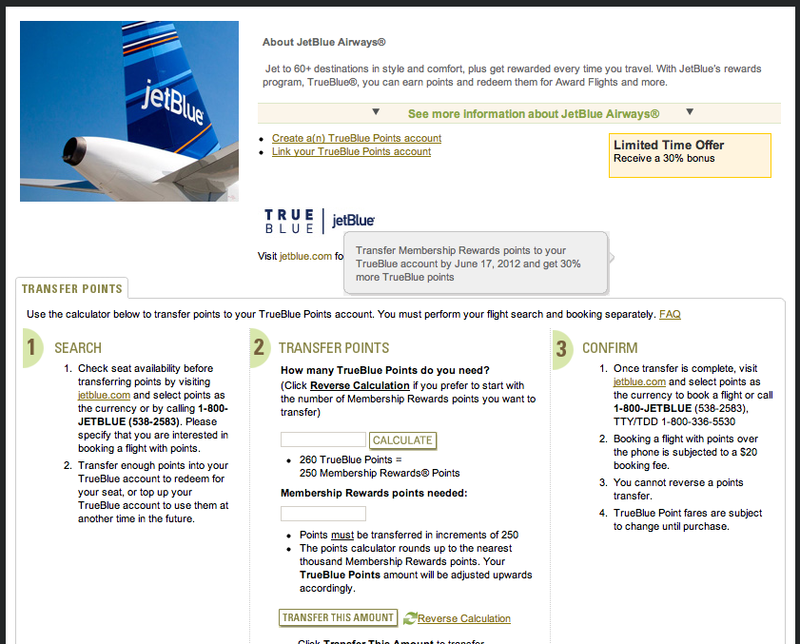 TrueBlue points can now also be redeemed on Hawaiian Airlines over the phone by calling 1-800-JETBLUE (538-2583). I generally reap more value from distance-based programs, but if JetBlue is your carrier of choice, or you’re planning to travel to or from one of their major hubs and were planning on using points anyway, you might as well get some extra value out of it. Remember, you can also transfer Amex points to anyone else (simply log in to your membershiprewards.com account -> Points Summary -> Scroll to bottom right where you see accounts, scroll to bottom and select “Link additional accounts”), so this might be a good time to top up your family or friends’ accounts to get them to levels needed for awards. Amex will even let you advance points for free as long as you earn them back within a year – 15,000 for Premier Rewards Gold/Gold/Green and up to 60,000 points for Platinum. So with this 30% bonus, you are valuing your Amex points between 1.08-1.56 cents each – not really spectacular. Especially considering that if you have the Amex Platinum card, you can use points towards buying any airfare at 1.25 cents per point and you earn points/miles and elite status on those redemptions as if you bought the tickets with cash. Even if you have a Premier Rewards Gold/Gold/Green card the Pay With Points program will give you a 1 cent per point valuation and you earn points/miles and elite status on those tickets. Still, if you’re near a JetBlue award level for a particular itinerary and you just need to top up your account, this could be a decent opportunity.